The previous post looked at the economic history of the United States over the past two centuries. In that post, what stood out most was the fact that the economy of the United States has always been one of the strongest in the world. There are three defining moments of American history after 1800, and this post will examine them. They are the Civil War, the Great Depression, and the Second World War. How did these events affect the economy? Economically and socially speaking, the United States was better than the vast majority of other countries in the world. The only two countries wealthier than the United States were Australia and the United Kingdom. The Civil War was a devastating event. It killed more Americans than any other war in history and destroyed the South’s economy. How did that affect the United States? Well, here’s the United States in 1865. In fact, the population and the economy of the United States has grown. The latter is in large part due to the effective economic policies of the Republican Party under Abraham Lincoln. It is true that living standards have grown slower than elsewhere. 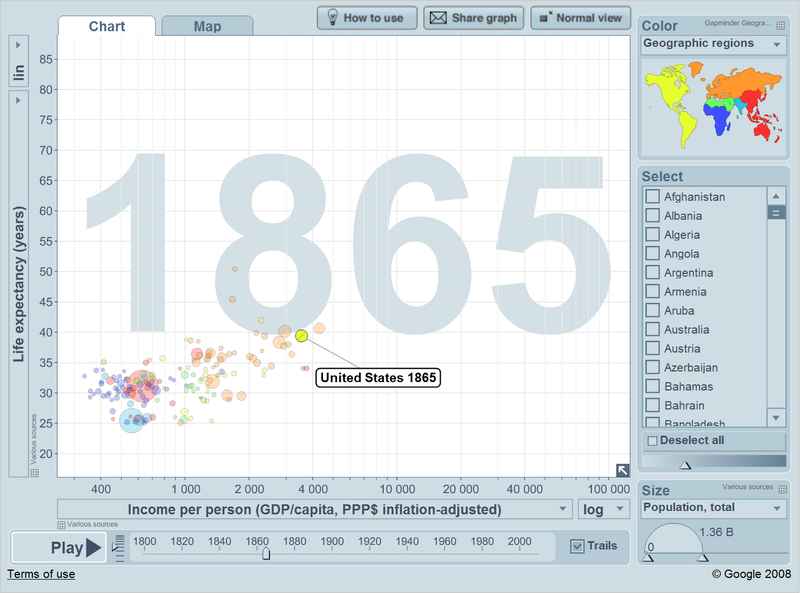 Still, the United States is very wealthy and very healthy after its worst war in history. …the life expectancy data comes from several sources. 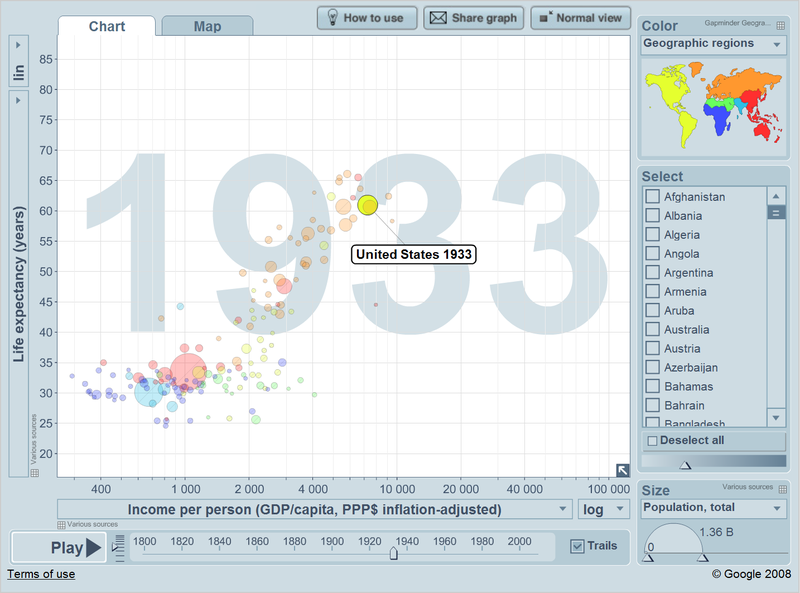 From 1989 to the present, gapminder uses US Census Bureau data. 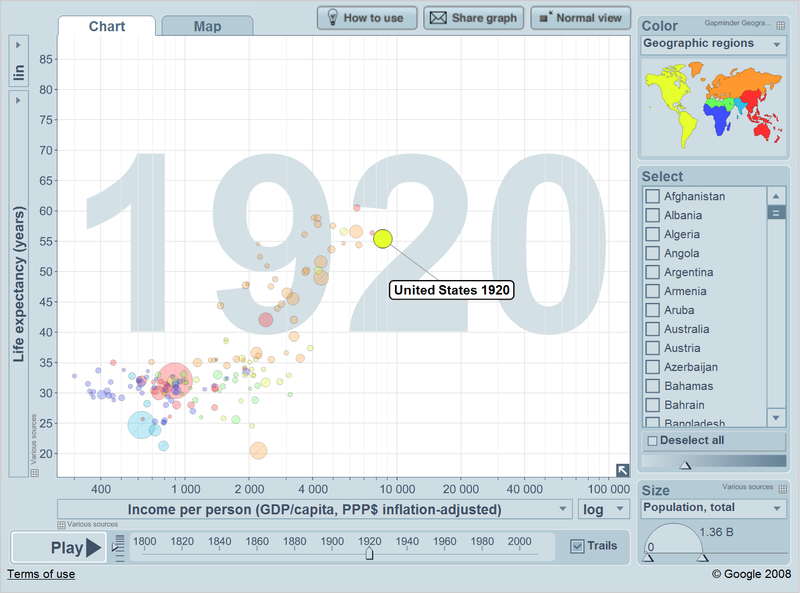 From 1933 to 1988 the Human Mortality Database is used. From 1901 to 1932 the Human-Life Table Database is used. From 1880 to 1900 Professor James Riley’s compilation of life expectancy estimates (from over 700 sources) is used. 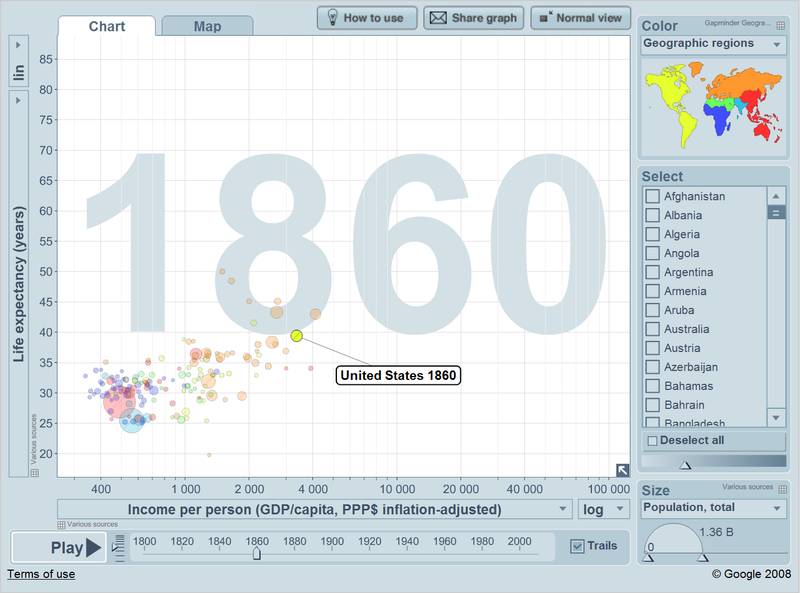 And what about from 1800 to 1879? Well, here the authors use a simple model. A very very simple model. They assume that all countries go through a health transition, and that the United States had not undergone this transition from 1800 to 1879. So gapminder sets United States life expectancy as 39.41 years for this entire 80-year period. Obviously this model fails during the Civil War. 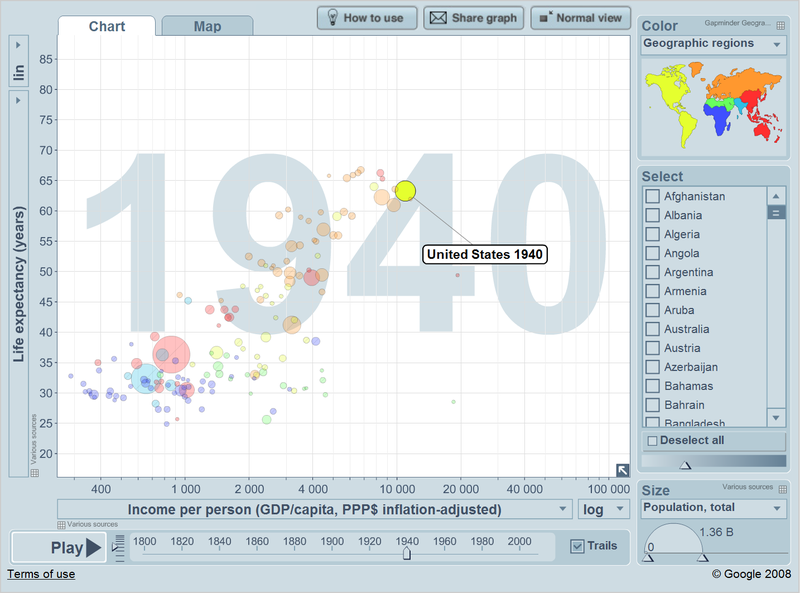 The United States is the richest country in the world in 1920, although in terms of health it isn’t doing as great. Let’s take a look at what happened afterwards. By 1933, in the depths of the Great Depression, the American living standard is actually worse than almost a generation ago. The good news is that Americans are a lot healthier. So the Great Depression was really as bad as it was advertised. Look at the other countries, however. As badly as the United States is doing, livings standards are still the world’s best. Only Brunei (due to its oil), Luxembourg, Switzerland, and the United Kingdom have a higher GDP per capita adjusted to inflation and purchasing power parity. 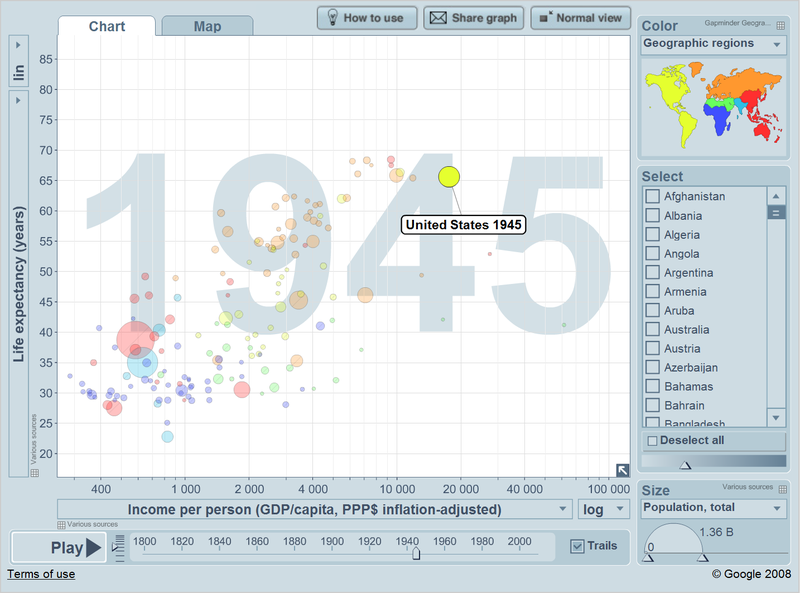 In 1940 Germany and the United Kingdom are almost at par with the United States. As is typical, however, America is slightly ahead of the First World in terms of livings standards but just above-average in terms of life expectancy. The destruction of World War II does enormous damage to the rest of the world, which falls behind. Only Brunei and Kuwait, due to oil, have higher GDP per capitas adjusted for inflation and purchasing power parity; their low life expectancy shows that this isn’t really an accurate reflection of their true economic strength at this time. At this time, the biggest countries behind the United States are Canada and the United Kingdom. The United Kingdom has a GDP per capita (adjusted for inflation and purchasing power parity) of $9,931; the United States $17,615. Of course, this nice situation for the United States couldn’t have lasted forever. Absent a nuclear attack against the Anglosphere, the rest of the world would have started to catch up with the United States again. And, indeed, this is what happened. It’s quite interesting how relatively little affect these great historical events had on American livings standards and life expectancy. Unlike other countries, the United States just keeps on a slow and steady growth path. It remains near the top or at the top. It would take quite a change – something far worse than the Civil War or Great Depression – to destroy this equilibrium. This entry was posted in Economy, Foreign Affairs and tagged America, Civil War, Economy, Great Depression, United States, World War II. Bookmark the permalink.